Peter is swiftly recruited into a secret department that focuses on the supernatural and magical, and apprenticed to the mysterious Thomas Nightingale, the leader and only other active member in this centuries-old department. Peter begins the long process of learning exactly how magic works and, at the same time, investigating who is responsible for the headless corpse, which will lead him on a complex and surprising adventure on the streets — and rivers — of London. City of Westminster Magistrates’ Court is around the back of Victoria Station on the Horseferry Road. It’s a bland box of a building built in the 1970s; it was considered to be so lacking in architectural merit that there was talk of listing it so that it could be preserved for posterity as an awful warning. Inside, the waiting areas maintained the unique combination of cramped busyness and barren inhumanity that was the glory of British architecture in the second half of the twentieth century. The novel is full of this type of quirkily effective prose, and the dialogues are likewise snappy and snarky (especially Peter’s, who sounds like a less annoying version of, well, almost every John Scalzi character). Combine that with the rapid but steady pace of the plot and you end up with one of those books you occasionally look up from, realizing you’ve been reading much longer than you thought. Peter Grant is the most well-defined character in the novel, mainly because Ben Aaronovitch deftly balances Peter’s various struggles throughout the book. On the one hand, he’s trying to master his magic (there are hints that magic has a methodical, even scientific underpinning going back to centuries of research) and investigating the strange, random murders occurring in London, but he’s also a bachelor in the city, dealing with the various young women he encounters, including an attractive colleague and the female personification of a Thames tributary (the original title of the novel is Rivers of London). Also, because Peter has a mixed-race background, the novel gives an interesting look at what life’s like for vaguely Arabic-looking young men in modern day London, especially when he’s out of uniform. The other characters in the novel never reach the same level of depth as Peter, but then again, this isn’t a novel you read for the deep character studies. It’s a fun, fast story, part police procedural (Aaronovitch has evidently done his research) and part urban fantasy, but it’s best not to take it too seriously and just go along for the ride. As for the main intrigue, set in motion by the headless corpse in the very first chapter but quickly becoming more and more involved — I’m not going to spoil it for you here. Suffice it to say that I didn’t see the big twist coming at all. Once Ben Aaronovitch suddenly puts the various pieces together (at right about the start of chapter 8), I was extremely surprised and very impressed. Even more promising are the hints that this is just the start of a larger story, as we’re sure to learn more about the nature of magic, the history of Peter’s mentor Thomas Nightingale and his mysterious maid Molly, and several other items that are only hinted at in this first volume of the PETER GRANT series (book 2, Moon over Soho, is due on March 1st). On the book’s cover, Diana Gabaldon describes Midnight Riot as “[…] what would happen if Harry Potter grew up and joined the Fuzz.” This is a good sound bite and probably will get many people to pick up the novel, but if you really need a comparison, it’s probably more accurate to go for something like Mike Carey’s FELIX CASTOR series or even Jim Butcher’s DRESDEN FILES. 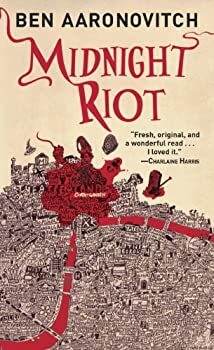 Regardless of comparisons, Midnight Riot is an excellent novel: it reads like a breeze but has just enough substance to keep you coming back for more. If you’ve read my reviews in the past, you may know I’m not a huge urban fantasy fan, but this novel was so refreshing and fun that I’m eager to read more of Peter Grant’s adventures soon. It takes a lot to surprise me with an urban fantasy anymore. Ben Aaronovitch does it. The supernatural thing that turns out to be going on here is nothing I EVER would have expected. What a great first novel! Peter Grant is a London constable who has discovered that the police force includes a very tiny magic section, and he becomes apprenticed to the force’s only wizard. I especially like the scientific approach Grant takes to figuring out how magic works. Editor’s Note: Rachael is in the UK where this book is titled Rivers of London. Every now and then a book will come along that will take you entirely by surprise. It may change your perception of what it is possible for a book to do: stories you didn’t know could be told, lengths you didn’t realise the imagination could stretch to. Rivers of London did just that. Before I really knew what I was getting myself into, I was immersed in the seedy supernatural underworld of London crime. The story is told by young police officer Peter Grant, who is about to be transferred to the Case Progression Unit, a branch of the London Met that specialises solely in paperwork. On the night of a murder in Covent Garden, Peter meets the only witness…a ghost. Enter Thomas Nightingale, Detective Chief Inspector and last officially sanctioned English wizard. Nightingale takes on Peter Grant as an apprentice wizard — the first in fifty years. He moves in to the Folly, Nightingale’s HQ, also home to the enigmatic Molly, the “maid,” who could’ve come straight out of the Adam’s family with her long black hair and eternal silence (plus the fact that Peter walks in on her in the kitchens one night to discover her eating a bowl full of raw meat). Nightingale teaches Peter the arts of magic in a lab that his house is conveniently kitted out with, during which his tasks include floating a mystical ball of light in his palm. Nightingale and Peters’ time is spent between two cases. Firstly, the murder that Peter is initially stationed on. This happens to be an evil spirit, hell-bent on revenge, possessing innocent Londoners with rage and warping their heads so that they look like Punch (of Punch and Judy fame) until their faces fall off. The other issue that needs resolving is an ongoing pursuit between two river gods. There is Father Thames, aka, The Old Man of the River, and his motley crew of traveller-types, who reside at a fair. He’s encroaching on the land of Mama Thames’, who resides down the south end of the river in London. Mama Thames has a formidable posse of women (many of them her daughters) consisting of Lady Ty (aka the river Tyburn), Fleet, Lea and Brent. Of particular interest is the young (and, it may be said, ridiculously sexual) Beverley Brook, who assists Peter with both the case of the killer spirit and the sparring between Father and Mama Thames. Until Beverley came along, Peter had actually pined after Constable Lesley May, an officer who completed her initial training with him and is the longstanding object of his fantasies and affections. It’s fun to see the dynamics between the two women pan out, and is a story line that I’m sure will be explored further in the books to come. Neblett was, of course, a career ‘uniform,’ and thus regarded plain-clothes police officers in much the same way as civilians regard tax inspectors. You might, if pressed, concede that they were a necessary evil but you wouldn’t actually let your daughter marry one. He rolls with the punches with an amusingly wry outlook on life, to the point where he is taking vampires and baby-murderers more or less in his stride. Not only is the narrative a delight, but the story is fast-paced and intelligently constructed too. 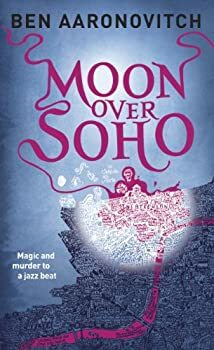 Aaronovitch’s story is infused with details of London, and the plot is beautifully balanced between the magical and the banal. The last book that had me feeling this excited was Gaiman’s American Gods, and Rivers of London delivers just as much delight. Published in 2011. 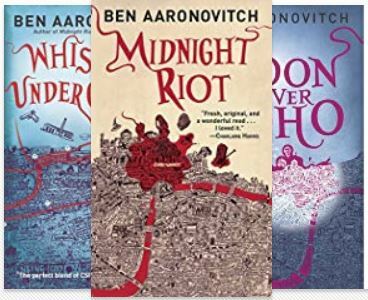 Midnight Riot was also published as Rivers of London in the UK. Publisher: Probationary Constable Peter Grant dreams of being a detective in London’s Metropolitan Police. Too bad his superior plans to assign him to the Case Progression Unit, where the biggest threat he’ll face is a paper cut. But Peter’s prospects change in the aftermath of a puzzling murder, when he gains exclusive information from an eyewitness who happens to be a ghost. Peter’s ability to speak with the lingering dead brings him to the attention of Detective Chief Inspector Thomas Nightingale, who investigates crimes involving magic and other manifestations of the uncanny. Now, as a wave of brutal and bizarre murders engulfs the city, Peter is plunged into a world where gods and goddesses mingle with mortals and a long-dead evil is making a comeback on a rising tide of magic. I read this one for the first time a couple months ago and loved it as well! I like your comparison with American Gods – it skates that line between recognizable mundane reality and the fantastical in the same down to earth way. I especially loved the humor in the book, which I think is the single most important thing that makes Peter Grant as engaging a character as he is. I laughed out loud several times! Thanks for the great review. You’ve got me interested in this one. This is one of my favorite series going right now. The first meeting between Peter and Nightingale still cracks me up. Like most Contemporary/Urban Fantasy series that do not have a set and short lived life, it’s not a perfect series, but what each book does what it sets out to do extremely well. Great series. This book raises a conflicting feeling since I see so many people giving this book five stars. It is certainly a different take on urban fantasy detective that involves mythological creature that’s not Greek gods, but instead rivers in London. The way that Aaronovitch tries to explain how the magic works are also interesting to read. Though, I have to say that it’s not that much of an amazing read. There are several problems that I found in this book. One, there is a strange barrier that blocked me from feeling the emotion of the character. It made the book felt rigid and cold. Two, while the mystery is interesting at the start the resolution is not, it’s both disappointing and also muddled thanks to the writing style. There is also a question as to why the book is called Rivers of London when the book is not about them. I want to like this book but this book feels like Dresden Files book with lower quality. The humour is not as great, the mystery is disappointing, and the writing is problematic for me. But this book receives a plus on the magic and the mythology.